Louis Latour is a big company, famed of course for their Burgundy wines, where they are major players as both Domaine vineyard owners and négociant, but with winemaking interests in other parts of France, a cooperage in Beaune and a significant business distributing the wines of other wine producers across the world. It is a family company still, headed up currently by 11th generation Louis Fabrice Latour, right, and headquartered in Beaune, the city at the heart of Burgundy. The Latour family business was established in 1797. 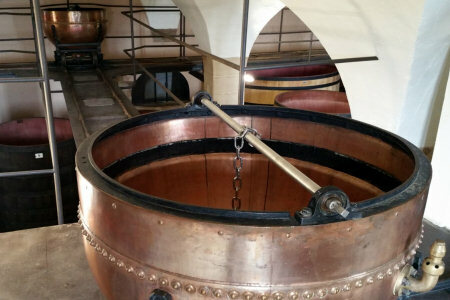 They remained as major wine growers until the 19th century, when they began to bottle wines and act as négociant, buying grapes and sometimes parcels of wine to age and bottle themselves. Louis Fabrice tells me how the 1930s and 1940s were some of the toughest trading times in their history, with the great depression and prohibition in the USA. So his grandfather switched the focus to domaine-grown wines rather than enlarging the négociant business further. 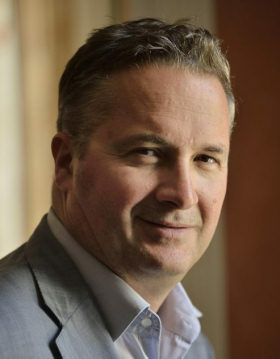 Louis Fabrice does confess to some worry that Burgundy is losing sales volume in the market, both because of a shortages due to recent small vintages, and to increasing cost of production driving up prices. “Even basic Macon is creeping over £10,” he says, “and so far the UK has not felt the full effect because of favourable exchange rates. 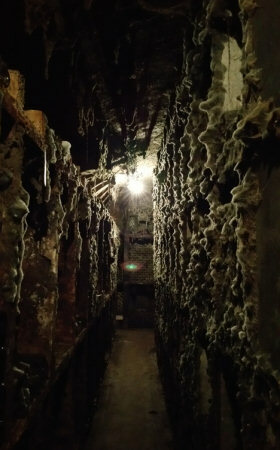 We don’t want to lose contact with our customers, and we are praying for some bigger vintages.’ Right: the très atmospheric cellars of the Château de Grancey, bottles covered in wine mould. I have already published the short film I made during a fascinating visit to Latour’s cooperage in Beaune, but just click the video below to view it before reading my extensive tasting notes. I enjoyed an extensive but rather whistle-stop tasting of 2014 wines in barrel with winemaker Nathalie Bobard, but don’t feel it would be appropriate to publish full notes. However the Batard-Montrachet was potentially exceptional, a superb wine with coffee bean and toast from the barrel as yet, but beneath great concentration and structure, a fabulous zest and precision too. It could be great wine in time. Louis Latour is mostly focused on the restaurant trade, though Majestic carries a good range of its wines, and the Bourgogne blanc and rouge are in Waitrose. Notes on 30 wines follow, from 2014 back to 1989. Note that négociant wines are bottles as Maison Louis Latour, whilst estate wines are bottled as Domaine Louis Latour. Creamy and verging on the tropical, with lots of fruit sweetness and richness on the palate, juicy with orange and ripe juicy apples, a strong lemony punch of acidity. 86/100. Typical Macon nose with light honeysuckle and floral notes over creamy apple. Much lighter and fresher on the palate than the Ardeche, with still sweet and ripe fruit, but a flowing acidity and light-bodied, attractive freshness. 88/100. Such a ripe, peach and almost mango like fragrance here, the vintage character perhaps, but lots of exotic ripeness amongst those lightly honeyed notes. On the palate too it is still light to medium bodied but has a sense of luscious ripeness over the orangey acidity of the finish. Long. 89/100. Flint and intense complex notes, a bit of wood evident, but plenty of ripeness. The palate has cool orchard fruits, a lime-like intensity, and a decisive acidity in the finish. Juicy and concentrated. 90/100. A little closed and mute, not terribly expressive aromatically, and though the palate has a nicely textured weight and intensity, it is not particularly fruity: more about a savoury earthiness and a touch of salt and lemon in the finish. 89/100. Beautifully creamy and hazelnut rich touches of custard and apricot and utterly charming. Powerful palate, great nutty concentration and a lovely shimmering length and freshness. Juicy and lemony, and though not enormously complex in the finish, utterly delightful. 93/100. A little more vanilla here, honey and sweet fresh character, with a nice juiciness at the core, though again it is very dry, touches of honey and sweet apple revealed through the mid palate with a little fat, but a long and concentrated finish that is quite stylish. 90/100. Lots of aroma here, with a little bit of herb and nutty character suggesting savouriness, and a hint of honeyed development. The palate has juicy fruit that is very fresh and squirts across the tongue with a fat lemony freshness, quite tight in the finish, good acidity, but weight and fullness too. A complex and structured wine. 91-92/100. Lovely weighty nose – quite plush for a Puligny in a way, with nuts and orchard fruits, but then little hints of blossom and waxiness. Long and full of flavour, a racy pithy acidity and lots of pure, fresh, crystalline fruit, that has a mineral and salt character as well as the fullness. 92/100. Wears the oak very lightly, a gentle custard and almond background, some complex sulphide reduction that suggests long life, but really focused on the tight, fresh orchard fruits. The palate is limpid and pure, another fine Corton with slippery texture and the fresh juice of lemons and limes, and a hint of fat, of peach in the mid palate before a long and very fresh finish. 94/100. Gorgeous fresh but nutty refinement, with such lovely hazelnut and orange notes, citrus skins and some salts. Beautifully fruity palate with delicious sweetness allied to piercing freshness of the acidity, but the toast and power of the structure and fruit depth power through. 94/100. A very late vintage, harvested in October. Big, powerful Jack Daniels nose, plenty of depth of aroma, a little coconut and some charming little floral notes emerging. Lots of layered subtle complexity here. The palate has delicious sweetness of fruit, hints of the exotic, but a fine, pure palate with beautiful balance. 94/100. Beautiful nose, only the merest hint of delicious and natural oxidation, giving lovely nuttiness and sweetness. The palate is superbly sweet and it has real mineral freshness. The cool vintage gives this seriously nice edge and mineral definition into a long finish. 95/100. A little reduced, opening with swirling to pretty cherry fruit. A touch of baked plum pastry. On the palate sweet and quite full, with a nuttiness and dry earthiness in the finish. 86/100. Much lighter and more delicate and open than the 2013 Bourgogne at this stage, a hint of briar and leafy bracken, and pretty cherry fruit. Light and savoury on the palate, there is a nicely roughening bit of tannin structure, and good grippy rusticity, giving this savoury and authentic appeal. 87/100. Relatively closed at this stage, with not a lot of fruit showing aromatically, but then it does open on the palate with juicy black fruits and a fairly liquoricy and dry finish. 86-87/100. Lovely sweet fruited nose, with very fine and solid cherry and red liquorice aromas, a soft sheen of smoke and gentle earthiness. The palate has good fruit, a nice serious bit of grip here, but there is a freshness and a gentle and attractive red fruit lightness too, giving this good length. 90/100. Quite closed, a touch reductive, with some leafy and lightly floral notes just appearing, and then the palate opening to show creamier red fruits and a lot of substance and flesh. Long and quite powerful. 89-90/100. Quite dense, almost chocolaty, with a real ripeness and richness and depth of fruit (the first 2010 of this line up). The palate is fleshy and plush, a big plum and blackberry ripeness, but it has a solid if slightly baked feel, plenty of smooth and silky tannin and sufficient acidity. Not as elegant as some of the lighter vintages, but impressive and Beaune like. 90/100. Fragrant with some floral and cherry, rose like tiny nuances and solid berry fruit beneath. The palate has a stripe of liquorice that is bittersweet and grippy, with a tight endive touch. Tight, very powerful and concentrated, perhaps a little too much in this vintage, but there is elegance. 91/100. Lighter and more open in colour, and has a lot more truffle and earthiness, and then it is juicy and ripe on the palate but a lovely length and purity, with lots of acidity and freshness, the wood felt as just a tiny balsamic note. Has more light and shade than the 2010s, but perhaps less structure and fruit concentration. 89-90/100. Fantastic concentration immediately with tight black fruits, a charming hint of cherry and floral character, but also slick and vanilla-touched, just hints of truffle and game well into the background. Structured and full on the palate, there’s a glossy sheerness of fruit but a plum flesh depth, almost balsamic and liquoricy, but the tight core of tannins and juicy acids helping to propel the finish. Concentrated, ripe and structured Burgundy, with time ahead of it. 93/100. Interesting aromatics – far less orthodox in a way than the Chaumes, with more lifted character, more perfume of truffle and game, and herby notes. The palate is flooded with sweet fruit over espresso, the oak ripe and richly toasty, but the fruit matching it well with its sweetness and density. Do juicy and sweet in the finish, but dry with creaminess to the texture, tannins and a good acidity, which arguably could be higher, but which does enough to leave this hedonistic and enjoyable. 93/100. Glorious colour with transparent ruby. Such a refined, incense and smoke, fragrant cherry and gentle truffle and briar wood. The palate has an enormously sweet core of fruit, the soft layering of vanilla and such fine gravelly and truffle intensity and savoury, dry character. Lively and deliciously focused in the finish, silky texture, great acid and tannin structure. 94/100. Very lifted and fragrant, lots of fresh red cherry and a touch of raspberry and red liquorice. Delicious light freshness, a really light on its feet style, with fabulous elegance and clarity. 93/100. Very youthful in colour after some 2010s, with perfume and a sense of lightness than I felt in the 2012 tasted earlier. Complex touches or red liquorice and chewy, fleshy plum and raspberry bright fruits, and a very fine and smooth tannin structure. There is power here again, there is concentration, but the freshness sets this apart from the 1er crus and the long, lightly spicy fruit filled finish. 94/100. Lovely mellow colour with a touch of soft ochre on the rim. Fine sweet earth and truffle aromas. Such a ripe rich core of berries and plum, but not heavy, there is some floral fragrance here too. Rich, almost voluptuous palate with coffee and a great depth of fruit, the silky tannins do add structure and the freshness is surprisingly good, with a lovely long, sweetly focused finish. 95/100. Lovely calm and harmonious nose, with soft smokiness and ripe, rich fruits. Such delicious sweetness and resolution here, with all the coffee and red fruits, but not as striking as the Vigne Saint or even the Vosne Romanées, it is lighter with less substance but has such lovely layered intensity and such fine tannins and acidity that I think this might just be in a slightly dumb phase – it is really very good, but perhaps will be better in a couple of years. 92/100. By contrast a very early vintage, hot and ripe. A blend of four different Corton parcels. Fine, attractive colour with ruby and a touch of blood and brick at the rim. Very delicate subtle complexity, a touch of dried blood and tobacco or dried herbs, and still quite bold red fruits. Delicious freshness on the palate, with a smooth, refined cherry fruitiness and although there is obvious ripeness in this hot year, it has a lovely edgy and briar freshness and little endive and cardamom notes. Very long and fine. 94/100. Haunting, beguiling and seductive, so much finesse so much soulful, deep red fruit pulp ripeness but also smoke and tobacco, truffle and just a touch of undergrowth, but really it is creamy fruit. The beautiful fragrance transfers seamlessly to the palate. So much fruit, a complete strawberry fruit pulp punch with fabulous depth and delightful tannin and acid structure – still giving lovely support with the sweet fruit persisting. 95/100.